I love gold ink. There, I’ve said it. I’m not a flashy person in personality or dress. But in my studio practice, gold ink is a necessity. Is one gold ink better than another? To answer this question, I put three inks to the test. This was my first gold ink. I was taught to do relief printmaking with lithography inks, and I’ve had this one for about eight years. Until October, it was my go-to gold. Straight from the 1lb. can, it is strikingly green-gold and moderately thick. Little evidence of grainy pigments. Update from Hanco: The can in the picture is about 10 years old and has been discontinued. You’ll want to try our Brilliant Rich Gold or our Rich Gold paste. They are much brighter than the old Metal Sheen metallic ink. I haven’t tried out the new Hanco inks, so if you have experience with them, please add your thoughts to the comments! Handschy RichGold has been my go-to gold for quite a while. 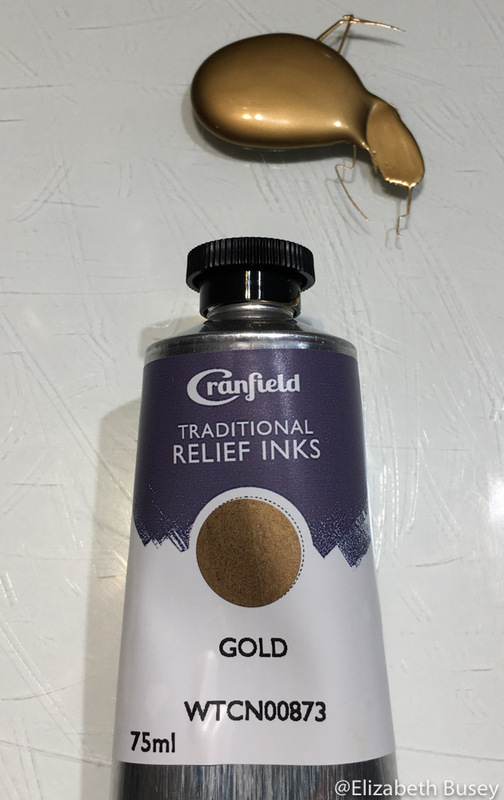 I just received this one, and I was looking for great color in a true relief ink. The color on the tube matches the ink itself — it looks like copper. When squeezed out of the tube, you do see evidence of some grainy pigments. I have been using this ink for a few months. Out of the tube, it looks the most like gold and is thick and stiff, with lots of grainy pigment. 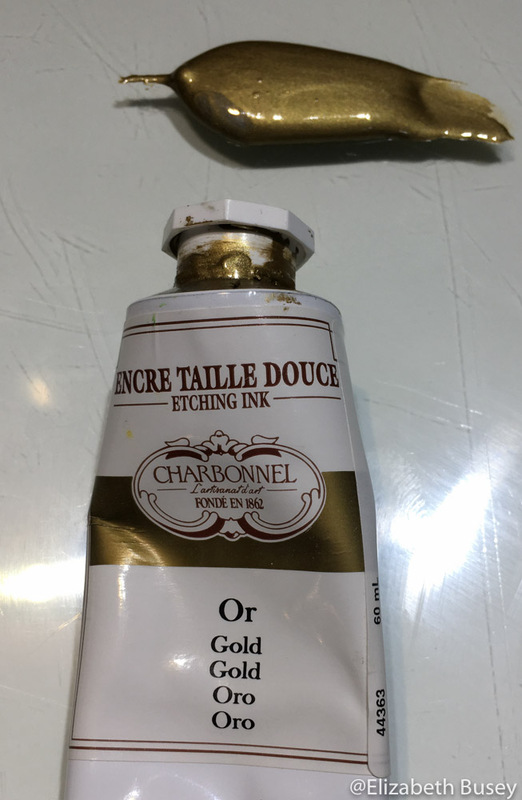 Charbonnel etching ink is quite stiff. I don’t usually use gold ink as a first layer. It would sink into my thick cotton paper and lose all of its reflective qualities. I wanted to see how each ink behaved when printed over previously printed colors. Luckily I had some unfinished bookmarks left over from this year’s Open Studios Tour that I could use. I modified each ink with a similar amount of Gamblin’s tack reducer, until each ink was viscous enough to be rolled out. 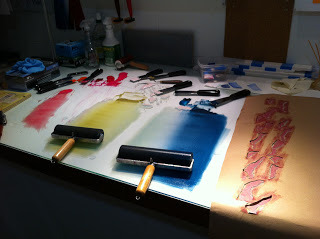 When similarly modified, each ink was rolled out and used for printing a bookmark. Left: Handschy, Middle: Cranfield, Right: Charbonnel. When rolled out, the difference in inks is quite apparent. The Handschy ink on the left is not very reflective, and looks more greenish-brown than gold. The Cranfield in the middle is more reflective, but is still quite coppery and dark. The Charbonnel on the right was the most difficult to roll out. It never gets buttery when mixed on the glass and rolls out into a stiff rectangle. When printed onto the unfinished bookmarks, the difference is even more clear. Both the Handschy and Cranfield and very dark and not at all reflective. By contrast, the Charbonnel is lighter, and its reflective surface contributes to a feeling of depth in the bookmark. Which ink do you prefer? My heart is with the Charbonnel. The Charbonnel is so superior to the others that I can’t see when I would ever use the other two. 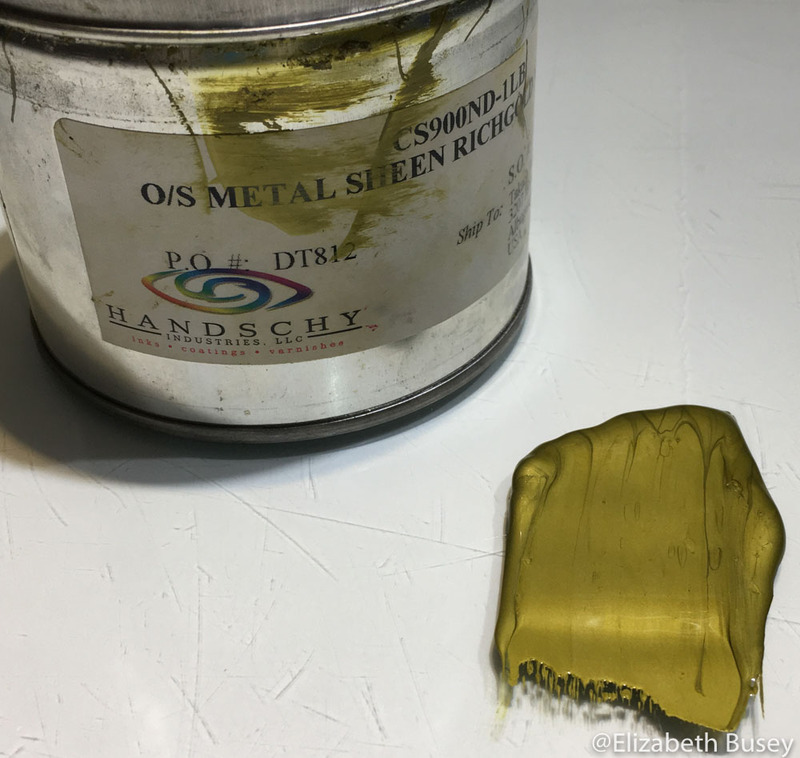 When you want a reflective surface, the ink with the most pigment is the one to use. Hands down. This entry was posted in Materials and tagged Charbonnel, Cranfield Traditional Relief, etching ink, gold, gold ink, Hanschy Rich Gold, printmaking, relief on January 18, 2018 by Elizabeth Busey. Two layers printed of my latest linocut featuring clouds. This entry was posted in Experimentation, Materials and tagged burnt plate oil, gamblin, linoleum, oil-based inks, printmaking, problems, relief, tack reducer on April 28, 2016 by Elizabeth Busey. A compilation of snowflakes — soon to be disassembled and transformed into thank you’s for my collectors. Watch your mailboxes! 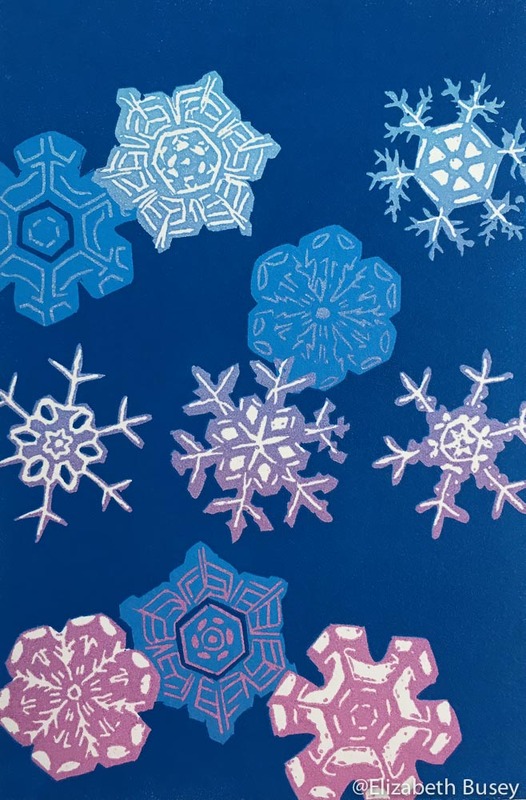 This entry was posted in Experimentation, Inspiration and tagged Bentley, iphone photography, Linocut, obsession, printmaking, relief, snowflake on December 21, 2015 by Elizabeth Busey. I should have been a sculptor. I am always trying to coax more depth out of a flat piece of paper. This is especially true when I am working on topography. In real life, tiny reflections of light glint off water, ice or metal surfaces to give us clues about depth. Painters and mixed media artists have it easy. Add some white, or something metallic. Glue on a mirror! Scrape off some paint to expose the white paper beneath. Certainly I can save some white paper, but it never has quite the same effect. 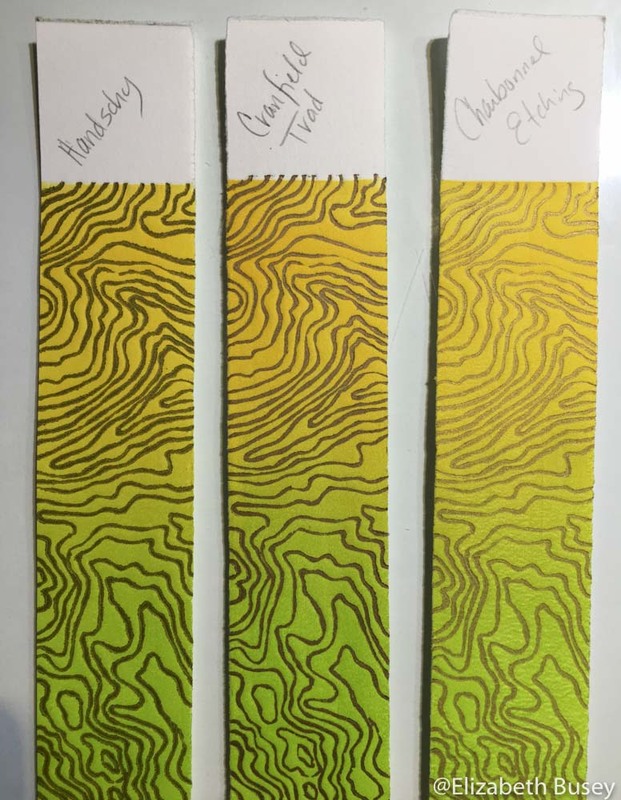 Topography inspired by the Himalayas. Are these mountains surrounded by water, or maybe a tropical coral? 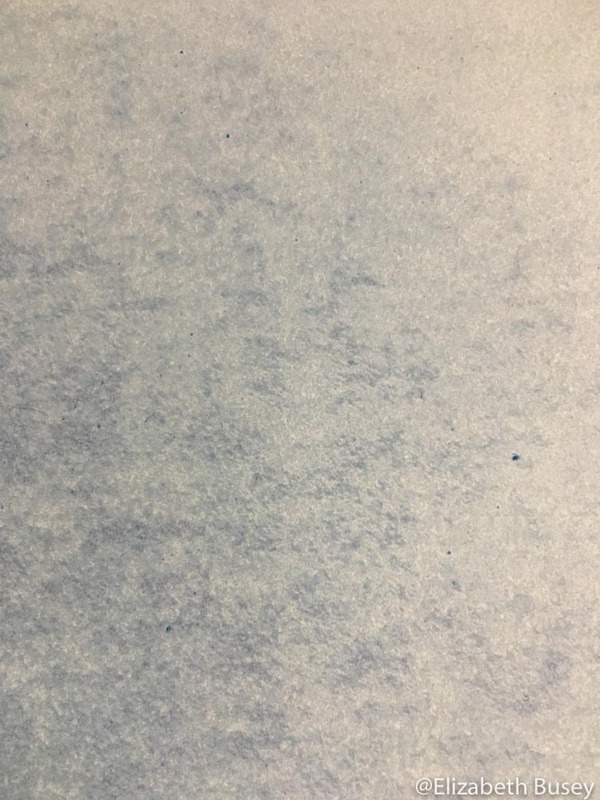 The white highlights are actually white mica on the teal layer of ink. After my many trials with gold leaf, a new strategy was suggested in a post by fellow printmaker Annie Bissett. She was using rice paste printed from a block to secure powdered mica. Traditional Japanese printmakers often use powdered mica to create highlights, and I was enchanted by the possibilities. So I ordered white, gold and silver powdered mica from McClain’s. 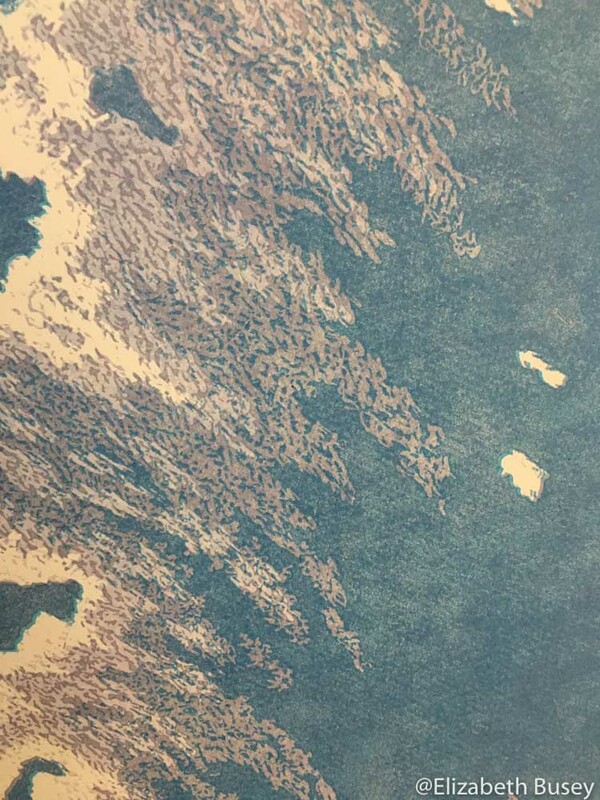 This entry was posted in Experimentation and tagged Annie Bissett, depth, gold leaf, highlights, Himalya, Japanese printmaking, Linocut, McClain's, mica, printmaking, reduction linocut, relief, topography on April 8, 2015 by Elizabeth Busey. I don’t know how Thomas Edison did it. Popular lore claims that he discovered 1000 ways to not create a light bulb before he achieved illumination. I’ve been experimenting with encaustic printmaking this fall, and while I have learned a great deal…let’s just say that I have not achieved my light bulb. I received some nice news this week that one of my favorite prints, Breath Intertwined (a close-up view of two red bud leaves) was accepted as part of the 2015 Delta National Small Prints Exhibition. This print went to Boston last fall, and is currently at the 57th Mid-States Art Exhibition in Evansville, IN. 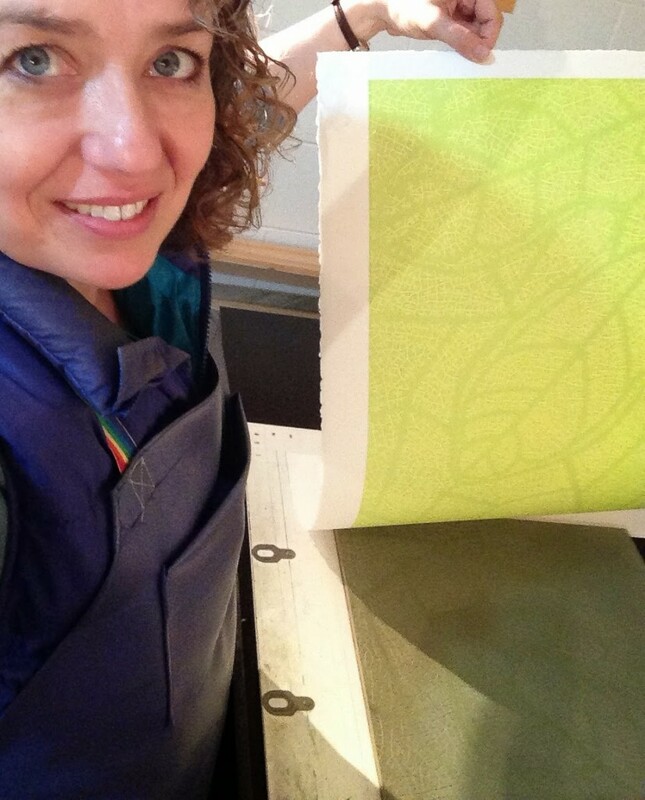 I thoroughly enjoyed creating this print, and this encouraged me to do another up-close leaf print. 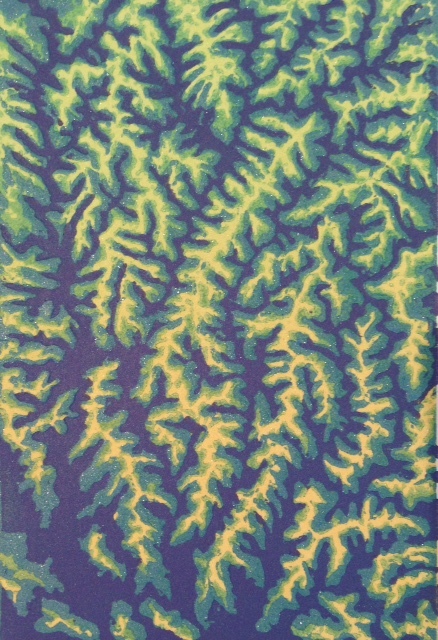 This entry was posted in Botanicals, Color Theory and tagged carving, cellular, Delta National Small Prints Exhibition, illumination, inspiration, leaf, Mid-States Art Exhibition, mixing green, perseverence, printmaking, relief, sassafras on November 21, 2014 by Elizabeth Busey. 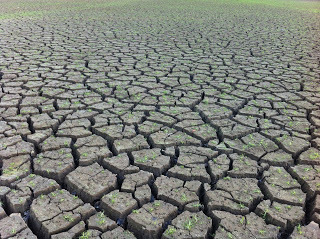 Dry midwestern lake bed. Would you put this on your wall? Every artist blog needs an image. 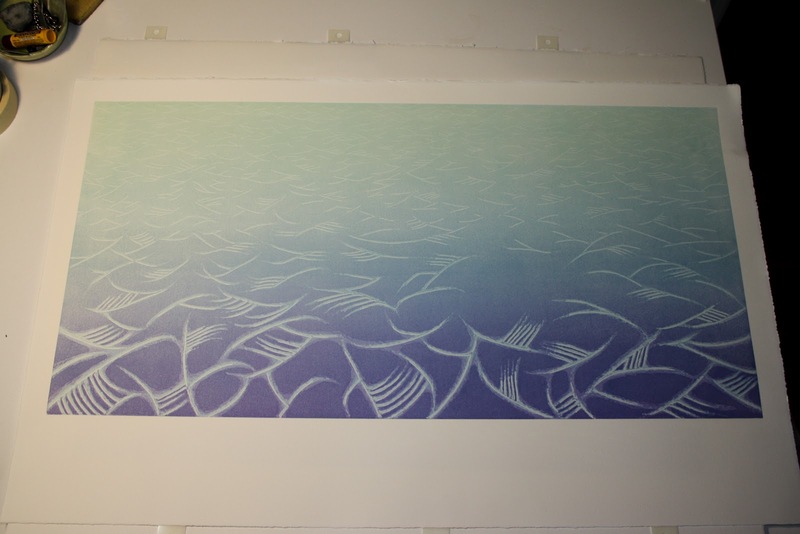 So when a print you have poured yourself into for weeks does not turn out, it is difficult to know what to do. It is heartbreaking, and a bit embarrassing as well. 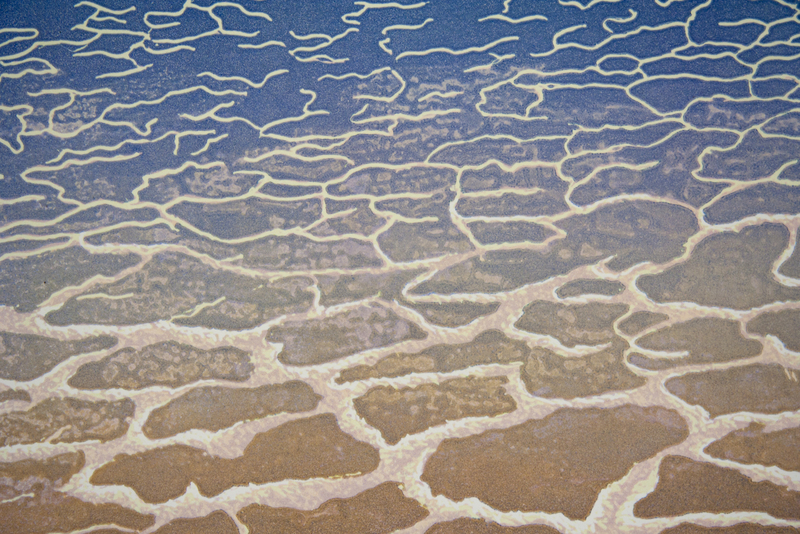 During the summer, a nearby lake was drained to repair a leak in the dam. 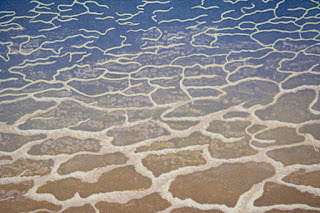 A severe drought helped the process, and by August you could walk on the lake bed and take pictures of these interesting patterns. I really wanted to use this pattern, but as dry earth, it only conveys lack, desperation and death. Not really the type of image I work with. So I tried to turn it on its head and imagine evaporation, perhaps with some tasty Mediterranean sea salt as a by-product. The print that shall not be named (detail). To try to get the idea of crystallization, I turned to etching for some interesting textures. I have now remembered why I prefer the dryness of relief printmaking. In this detail, you can see some of the areas that were etched. I actually etched the block three times, and found it to be a very random process. The changeable autumn weather played havoc with the experiment as well. Sometimes the etch dried quickly, and other times it stayed hydrated and ran off the block — and under the tape I had applied to protect the MDF (medium density fiberboard) block. Pulling out all the stops in the studio. As I was cleaning off the block the last time, the MDF was beginning to expand and decompose. I knew this was the last time I could print with this block, and there were still many problems to be solved. 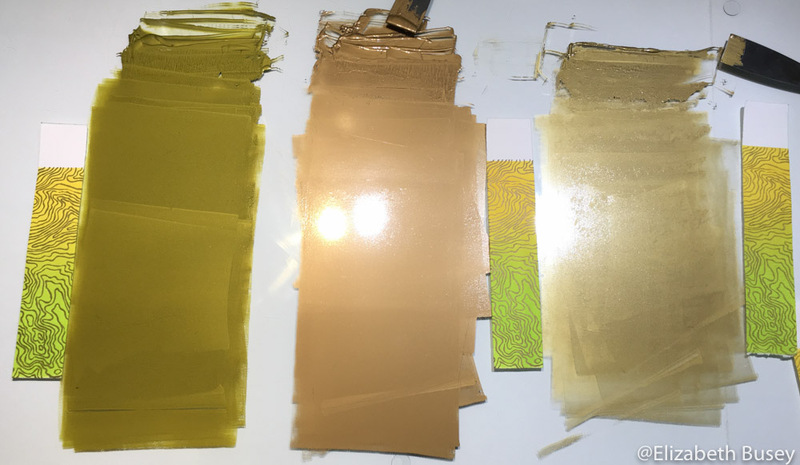 So I pulled out all the stops — a frisket for some details, and two different gradations. 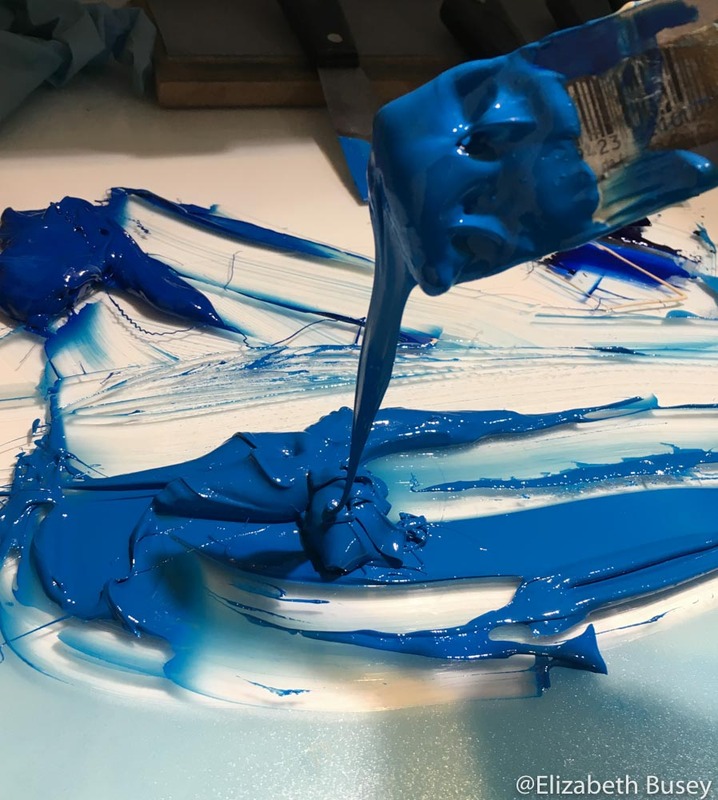 I gently eased the block back and forth from press to table, but in the end there were perspective problems that had been there from the beginning, and couldn’t be solved with another layer of color. I thought long and hard about whether to put the whole print on the blog, and decided against it. Once it is here, it has a life of its own. At my house, it glares at me as it dries in the studio. We need some time apart, this print and I. Time to head to Starbucks for a ridiculously expense coffee, sketchbook in hand, to try to regain my artist inspiration. You can’t always get what you want, but if you try sometimes, you just might find you can stuff it in a bottom drawer. This entry was posted in Artistic Growth and tagged drought, etching linoleum, evaporation, failure, gradations, mdf, printmaking, relief on November 13, 2012 by Elizabeth Busey. Summer in the Midwest has been a combination of searing heat and unrelenting drought. I feel as out of shape as if it were February, hibernating in my basement studio dressed in shorts. Questions abound — when is this going to end? What does this mean regarding climate change? Should I change the front yard landscape to cactus? Will we still be able to get that fabulous bi-color corn from the Farmer’s Market? Will future summers also be this hot? My latest print looks at the world within a much longer time frame. A Bloomington collector friend suggested I look at the mountain ranges in southern Colorado. I learned that these mountains were formed by several different geological upheavals over a vast time span. This movement, along with the punishing effects of water, wind and sun, have created ranges that are alive with serpentine energy. This entry was posted in Color Theory, Techniques, Topography and tagged drought, frisket, global warming, masking, mountains, printmaking, relief, serpent, spine on August 13, 2012 by Elizabeth Busey. Spirals are a common theme in many of my works, because nature seems to favor this pattern of growth. My latest prints are both spiral-inspired, but from very different places on Earth. The chambered nautilus actually builds a new section of its shell each time it outgrows its current home. In early spring, fiddleheads appear in my garden, poised with plant kinetic energy, ready to unfurl new fern leaves. This entry was posted in Artistic Growth, Botanicals and tagged chambered nautilus, dremmel, fiddlehead, growth, linoleum, New Year, printmaking, reduction, relief, spiral, u-gouge, v-gouge on January 6, 2012 by Elizabeth Busey.